Regulate industry globally so all new air conditioners have a minimum of 25ºC(77ºF). Reset existing equipment to comply this new standard. Relative humidity is very important factor for human comfort.According to the following diagram by Hoyt, Schiavon, Piccioli, Moon, and Steinfeld (2013), 25ºC (77ºF) is a temperature that is inside the comfort zone for almost all values of relative humidity. Meadows showed in Leverage Points: Places to Intervene in a System (Meadows, 1999) that changing the system's goals is a very high impact intervention. We think that this is something new, using the optimal 25°C (77°F) has already been suggested, but setting it as a temperature goal by COP22 and country governments is something new that might have a very important impact on global sustainability. The reason is that many people do not understand the impact of changing only two or three degrees in the AC setting remote controls. 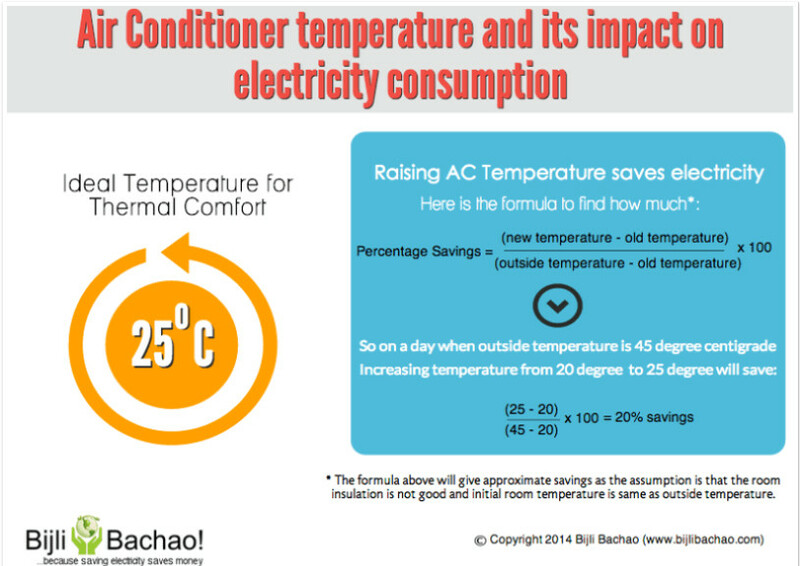 Energy savings show great sensibility: just changing the temperature from 23 to 25°C multiplies savings 350% from 4% to 14%. 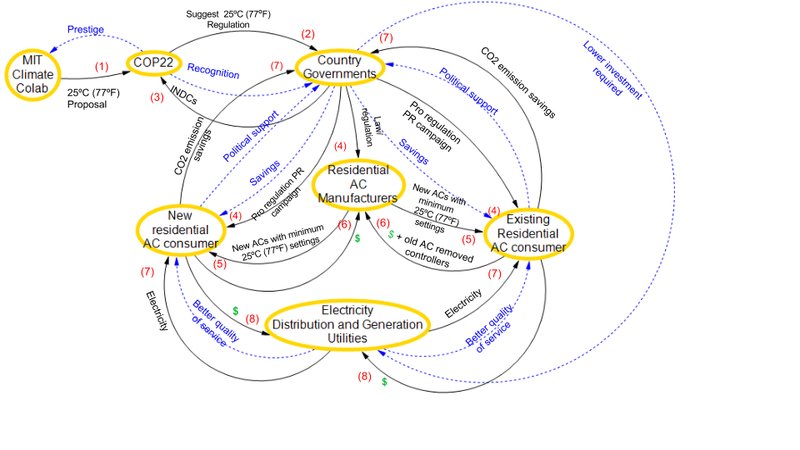 and from US AC industry (Farr, 2012) suggest that this process would take between 15 to 20 years. The proposal will save 14.07% of residential AC energy consumption worldwide, or 1.68 % of global energy supply, according to our calculations this will amount to 327 TWh/year of energy savings worldwide and would amount to 29500 Million USD saved per year. Industry must set remote controls of all new air conditioner equipment so that when they work in "cool mode", they have a minimum setting of 25ºC (77ºF) instead of 18ºC (64ºF). This regulation is valid for inverter ACs as well as non-inverter ACs. Inverters are more efficient than non-inverters, but if they are set at for example 18ºC(64ºF) they will end up using much more energy that when set at 25ºC(77ºF). Obviously, when using the AC in "heating mode" the ACs would not have this limitation, for example, for heating purposes they could be set to 20ºC(68ºF). For existing air conditioners, we propose resetting only the air conditioner remote controls, the rest of the Air conditioner equipment remains as it is. Governments trying to comply with COP22 INDCs might institute a resetting program, and the Public Relations awareness campaigns that we have planned. Resetting AC remote controls should be something similar to resetting TV remote controls. Each AC manufacturer should reset remote controls by modifying parameters of their circuit boards. New air conditioners should have their remote controls reset with the 25°C (77°F) minimum temperature limitation. This is important, because AC devices controlled through smartphones via the Internet of Things might be easily set to a lower temperature using PCs, netbooks and / or even cell phone via ad hoc software applications. Attractive incentives might be considered to discourage such behavior, but ideally applications should block this possibility. New and reset AC remote control screens should show the amount energy consumed and the average savings produced by this proposal in terms of KWh, tCO2e and in USD. Showing the amount of tCO2e, energy and USD on the remote control screen might help getting public awareness supporting this proposal. It is very important to generate public awareness on the impact of AC temperature settings on global emissions and on energy and money savings. As we said before, showing the amount of tCO2e, energy and USD on the remote control screen might help getting public awareness supporting this proposal. Perhaps public awareness and support could be enhanced by alert messages like “think about the impact of all the money you have saved, the amount of emissions that you have avoided”. All newspapers and other transmedia should publish daily information about climate change metrics, like how much emissions, energy and energy costs were accrued per day. Reset remote controls should be redesigned in a way to be as tamper - proof as possible. New equipment would be limited to work with a minimum 25°C (77°F) temperature setting, so in principle, no tampering would be possible on new equipment. Energy distribution companies could control residential AC equipment settings through The Internet of Things –IoT-, so that the vast majority of users comply with the proposed regulation. We also feel that this proposal is targeted to the majority of people who comply laws so that they benefit from this poka - yoke approach (ASQ, 2016). Those who tamper with the AC minimum settings will pay on average 14% more in their electricity bills,might receive the same treatment as “black hat” hackers. Keeping older remote controls means higher electrical energy bills for those who keep them. Finally, given the worst case scenario that it were not possible to make remote controls 100% "tamper proof" these old ACs will end their life cycle in 15 to 20 years or less, and be replaced by new tamper - proof which do comply with the regulation. As Ford showed with his successes, normalization can have a huge impact in a system, and more so if the system is set to an optimal point. So setting all residential air conditioner remote controls to an optimal temperature can have a profound impact on climate change reduction efforts. In terms of air conditioners, the Henry Ford quote would be "you may set the temperature of your AC to any temperature as long as it is 25°C (77°F)", which is the optimal AC temperature setting. Part of the novelty of our proposal also comes from using the "Poka Yoke" approach to AC climate change related issues. 194 MtCO2e equals the GHG emissions of countries like Viet Nam, United Arab Emirates, Argentina or Venezuela. 327 TWh is equal to the bioenergy generated in the world in 2011. 327 TWh is similar to the energy consumed by The United Kingdom or Italy per year. 29500 Millions equals to the GDP of countries like Paraguay, Latvia, Cameroon, Trinidad and Tobago or Bolivia. 2) COP22 adopts the policy and recommends each country's government to implement it. 3) Country governments include this new regulation as part of their INDCs. 4) Country governments implement PR campaigns showing the benefits of the new industry standard. At the same time, country governments pass legislation / regulations requiring that all new residential AC remote controls should have a minimum 25C(77F) setting and that all existing remote control equipment should be reset with this new industry standard. 5) Manufacturers redesign AC controllers to comply with new regulations and starts selling new ACs. At the same time, manufacturers replace existing AC controllers with the new regulation complying ones. 6) Customers pay for the new modified ACs and also pay for the reset AC controls, because they will benefit from the energy savings, cost reductions and better quality of service. Energy distribution companies could help to absorb the resetting cost because this reprogramming will avoid doing more investments for expanding the carrying capacity of their distribution network. 7) Energy distribution utilities provide electricity to new and existent AC users. Energy distribution companies benefit from lower needs for investments in new infrastructure and maintenance. Lower energy demands help improve their quality of service, with fewer blackouts and less energy shortages. 8) Users pay for the electricity to electricity distribution and generating utilities. The sequence of these actions and value exchanges can be visualized in the following chart. The sequence numbers are in red. Black arrows depict the above actions and exchanges, and blue arrows depict emergent value created by these actions and exchanges. Main roles are encircled in yellow. 1) Climate Colab influences COP22 leaders so that each country's government include this proposal in their INDCs. 2) ONGs support the proposal at CO22 and later while the proposal is being implemented in each country. 3) Country governments include the proposal in their INDCs and regulate each country's industry to comply with the 25C(77F) minimum setting requirement. 4) Governments enact a PR campaign to show the public the benefits of adopting the 25C(77F) AC minimum setting standard. 5) All Air Conditioner manufacturers in all countries should manufacture all new equipment with this new industry standard. 6) People buy these new ACs and have their existing ACs controls rest in order to save money, energy and to contribute preserving the environment. 7) All electrical energy distribution companies could help reprogram existing controllers because it lowers their infrastructure investment requirements during demand peaks and because having a lower demand improves the quality of service. 2) In each country: Local governments should enact regulations so that each manufacturer implements it locally. People comply with the reprogramming of the old AC remote controls. 0.25 x 46000 = 11500 Million Metric Tons of CO2 equivalents. 1380 Mt of CO2 x 14.07% = 194.16 Mt of CO2 equivalents. 1) Energy savings: 1.68% worldwide lower energy and heating. 194 Mt CO2e /0.0005925 tCO2e per kWh (Carbonfund.org, 2016)= 327 TWh/year. 2) Cost savings: with an estimated average energy cost of 90 USD/MWh, savings add up to 29500 million USD /year. 3) Lower energy distribution infrastructure requirements. 4) Lower infrastructure investments in energy generation and distribution. 5) Better quality of service. For example, in cities, like Buenos Aires, with demand excesses it would produce less energy shortages and blackouts. 7) Better government image and reputation. Government benefits from an improved image in relation to an improved quality of service by energy distribution utilities. 8) Savings can be reallocated to other clean energy initiatives! 9) It is cheaper for energy distribution companies to pay for the AA remote control reprogramming cost, because they will avoid doing more investments in expanding the carrying capacity of their distribution network. 1) Cost of AC remote control resetting by manufacturers. 2) Cost of resetting and replacing of all existing remote controls. 3) Cost of the PR Campaign communicating the value proposition of this initiative. 4) Maybe some media would do this communication free in some countries because of the positive impact in their brand value. 5) Communication costs could be part of the government's political campaign! 1) Include it in 2016 COP22 negotiations in the energy efficiency think tank, and get it approved by COP22's end. Include it in next global agreement. 2) In 2017 all AC manufacturers should reset the remote controller to be manufactured. 4) By 2020 perhaps 30 to 30 % of residential ACs comply with the new standard. 5) By 2030 almost 90 % of residential ACs comply with the new proposed standard. Ford, H., Crowther, S. (1922). My Life and Work, Chapter IV, p. 71. Doubleday, Page & Company, Garden City, New York.